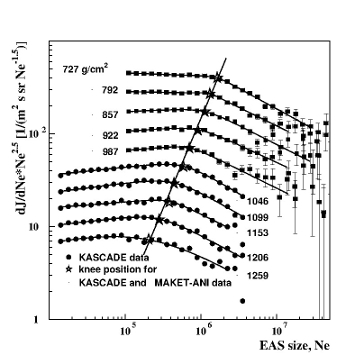 The size spectra measured by MAKET-ANI and KASCADE experiments. 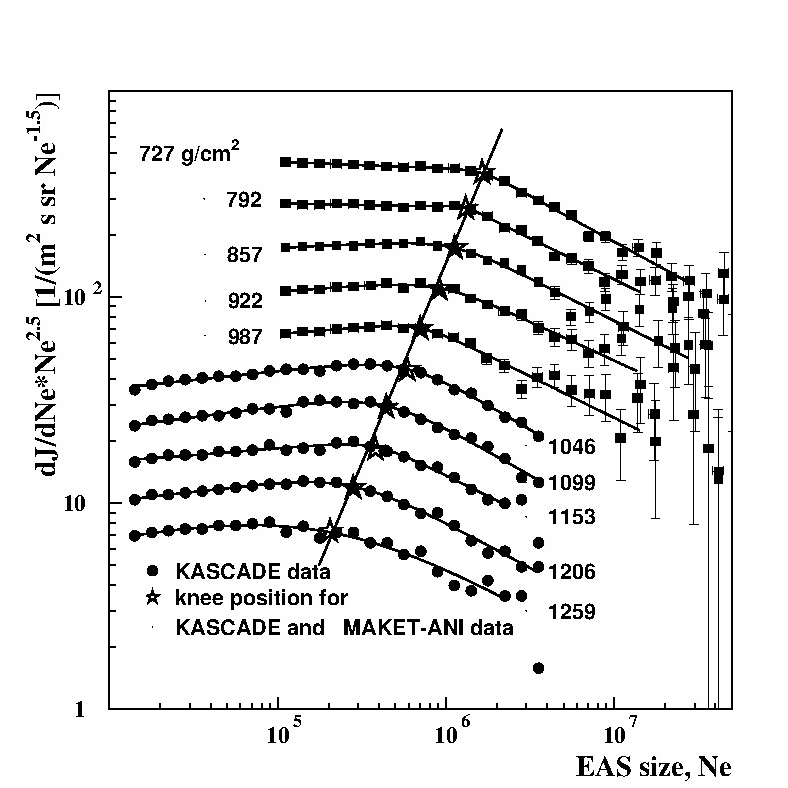 The slant depth covered by experiments comprises 720-1250 g/cm2. The solid line illustrates the EAS attenuation versus slant depth in the atmosphere. 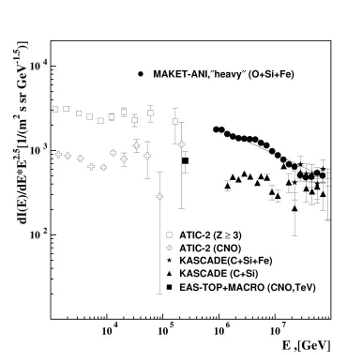 The energy spectrum of the "heavy" nuclei group measured by the MAKET-ANI detector along with spectra from KASCADE, EASTOP + MACRO and ATIC-2. The solid line is a power function approximation. 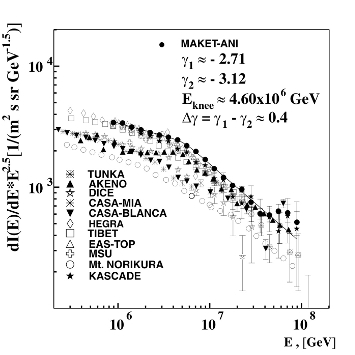 The all particle spectrum from MAKET-ANI data compared to the world data. The line shows the fit to MAKET-ANI data (integrated into 0-30 zenith angle interval). 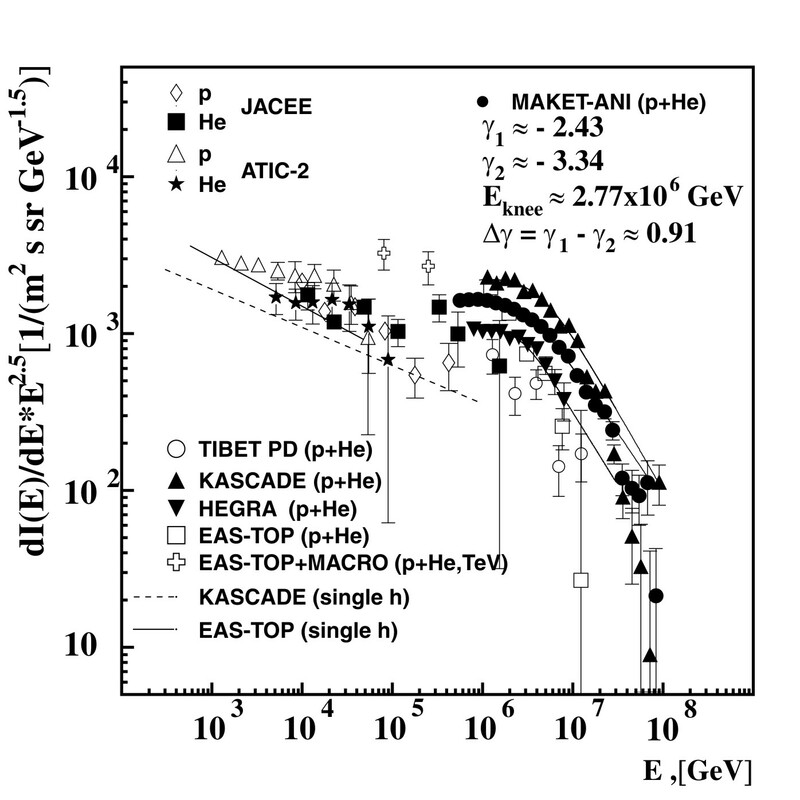 KASCADE, EASTOP, TIBET, HEGRA, AKENO, CASA-MIA, CASA-BLANCA), DICE, Mt. NORIKURA, MSU, and TUNKA. 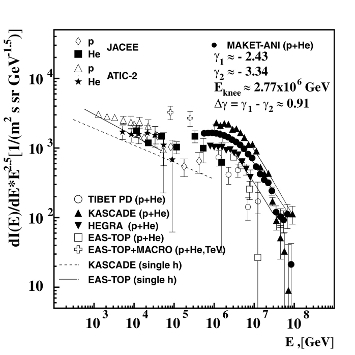 Primary light component (p + He) measured by the MAKETANI detector in comparison to the results from KASCADE, EAS-TOP, HEGRA, EAS-TOP+MACRO, TIBET and primary protons spectra approximations obtained by the single hadrons fluxes EAS-TOP and KASCADE. 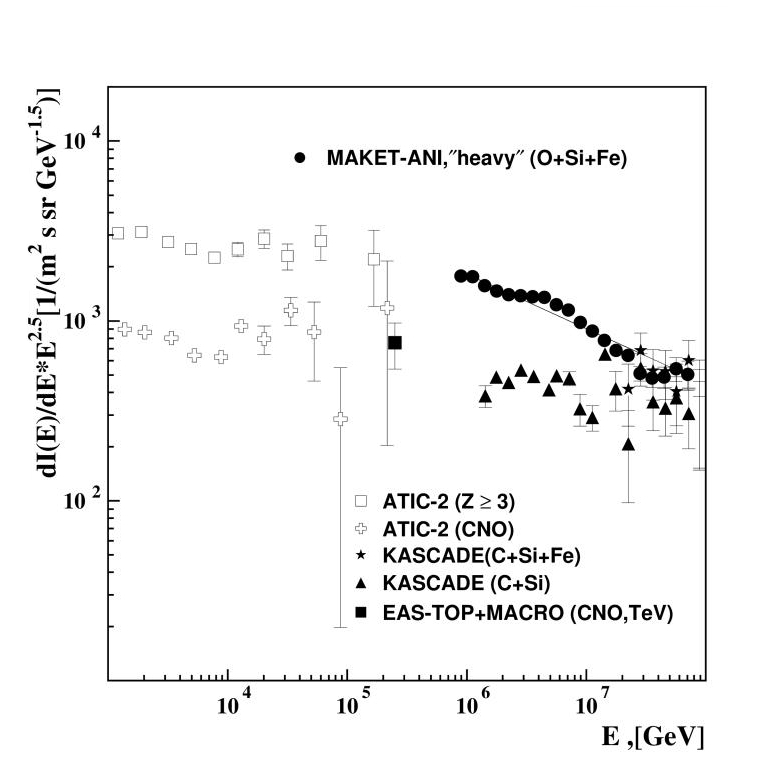 The direct balloon measurements by ATIC-2 and JACEE at 102-105 GeV are also presented. 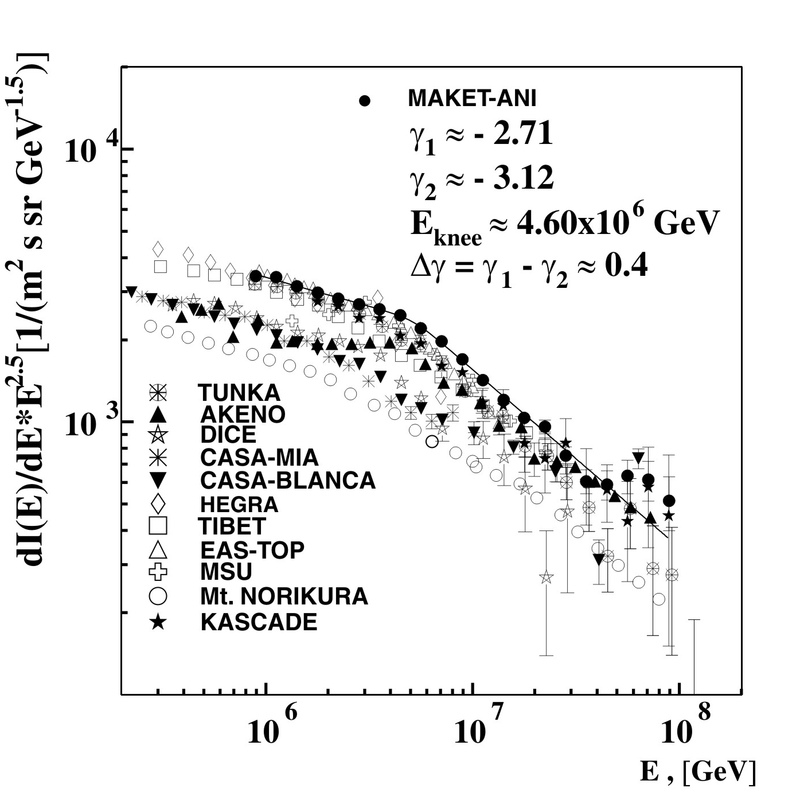 More details about MARKET-ANI experiment results you can find in publication and numerical data.